Facebook has today announced Signal, a free discovery and curation platform that journalists can use to see what’s trending on both Facebook and Instagram. Available on desktop-only for now, it’s main purpose is to make the news-gathering process easier. This comes one week after it made its Mentions app available to journalists with verified profiles, so Facebook is ramping up its efforts to win over journalists, who tend to rely on Twitter as a news source more so than Facebook. Signal makes it easier to find content, so presumably this means more of it will be showing up in articles and on blogs. Signal can be used to see what conversations are popular on Facebook and then monitor what ones are trending and being shared publicly. There’s also a search option that allows journalists to find past posts from both people and Pages. Any information found by a journalist in Signal can then be saved in various ‘collections’ for later use. As well as posts, Signal ranks public figures who are being mentioned the most in real-time. And for Instagram, journalists can search using locations and topics, but only public posts will show in the results. 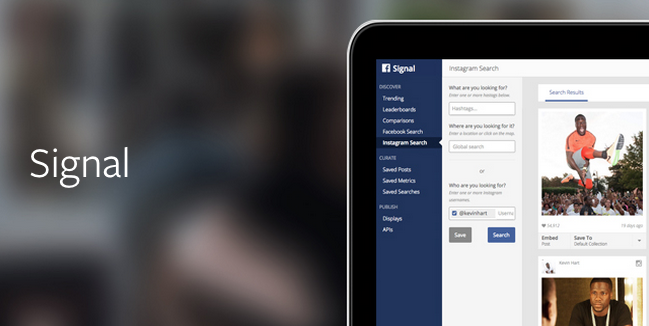 All of the posts found on Signal, from Facebook and Instagram, can be embedded directly from the platform. One neat feature is that Facebook has made Signal’s API embeddable, so it could be used for content feeds or as a way to accompany coverage for an event. Signal’s available now for all journalists to request access to and Facebook says it will be taking feedback into account to improve and tweak the service over time.